Inciner8R is a thermogenic dietary supplement designed to boost energy levels and increase the metabolism to provide improved fat burning. Prolonged calorie and appetite control. Supports your workout program and helps get you ripped. What is Inciner8R and How Does it Work? Losing weight is not easy. A combination of hunger pangs and diet-related fatigue can be enough to make many dieters throw in the towel; and the change to a healthier diet, that does not contain favourite foods, can have a negative effect on the mood. Like many other dieting products, Inciner8R is designed to ease the weight loss process by suppressing feelings of hunger and speeding up the metabolism to make the body burn calories faster and get to work its stores of fat sooner rather than later. The formulation also contains ingredients to elevate the mood. In theory the blend should offer some good benefits, but in practice good results will require the right blend and quantity of ingredients. Let’s take a look at that now. Each capsule contains 1485mg of the Inciner8R proprietary blend. Caffeine Anhydrous (395mg): A respected energy provider that is also a proven fat burner. Choline Bitartrate (200mg): An ingredient that appears to boost mental focus and may improve the memory. L-Tyrosine (150mg): Although L-Tyrosine is sometimes believed to be an appetite suppressant this ability has never been satisfactorily proven. Large does may increase alertness, but the amount provided here is insufficient. L-Carnitine L-Tartrate (125mg): The results of a study conducted at the University of Conecticut suggest supplementation with L-Carnitine L-Tartrate may protect against muscle damage and speed up post-workout recovery times. Bacopa Monnieri Extract (100mg): A popular nootropic that is often used to improve memory function and reduce anxiety. Dandelion Leaf (100mg): A diuretic that will encourage the body to retain less water. This will create the illusion of weight loss. Juniper Berry Extract (100mg): Another popular diuretic. L-Theanine (100mg): An amino acid that can aid relaxation and may help negate some of the negative effects of caffeine. Theacrine (80mg): A stimulant that is believed to offer similar benefits to caffeine. Citrus Aurantium Extract (50mg): A fruit-based ingredient that contains the fat burning stimulant synephrine. White Willow Extract (50mg): There is some evidence that white willow may encourage weight loss when it is combined with kola nut and ephedra, but neither ingredient is included in the Inciner8R blend. Acetyl L Carnitine (25mg): An amino acid that might be capable of influencing the metabolism and aiding muscle development, but further study is required. Theobromine (10mg): A compound derived from cocoa beans. It provides mild stimulation and may also help improve the mood. Huperzine (150mcg): A popular cognitive enhancing ingredient. The recommended initial dose is one capsule per day, taken with a glass of water, before the first meal of the day. If no tolerance issues are encountered it is permissible to take a second capsule each day. Amazon.com has over 1500 customer reviews, the majority of which praise the product to the high heavens. However, many of the people who left positive reviews admit they received a discount in exchange for their feedback and some customers even say they were given the product free of charge. Several customers have reported side effects, so we suggest all potential users seek a doctor’s advice before using Inciner8R. 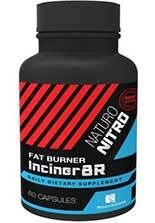 At the time of this review we were unable to find any online stores that were still selling Inciner8R. Nor were the pills listed on the manufacturer’s website, so it appears the product has been discontinued. However, Amazon.com still had bottles for sale and the price per bottle was $24.97 (£19). A private seller had the product listed on Amazon UK and was asking £124.99 per bottle. This is a ridiculous sum of money, and it is possible the product may not be genuine, so this is not a recommended option. The manufacturer offers a 30-day money back guarantee, but if a refund is required it will probably be easier to claim using the Amazon Returns Policy. Inciner8R contains some good ingredients, but several of them are stimulants and some people do not tolerate stimulants well. This is a fact that may explain all the reports of side effects. It is probable the formulation has value as a weight loss provider, but it is likely best suited for bodybuilders and other athletes who have built up a tolerance to stimulants by the long-term use of other supplements. However, bearing in mind the fact that the product appears to have been discontinued, and any remaining stock will be difficult to get hold of in the UK, this is a mute point. Fortunately, better options are available.